Tolga gets things rolling with ‘BNM789’, a 9-minute excursion into boogie wonderland. Teased along by a funky rhythm, the low end is bulbous and a little offkey, while the beats keep everything steady. Tolga’s swing is irresistible and he keeps things very much on the unconventional tip throughout this epic cut; a prime example of his ability to create music that adds something fresh to the dance floor. After that we have ‘Nesia’, which exudes warmth and character. 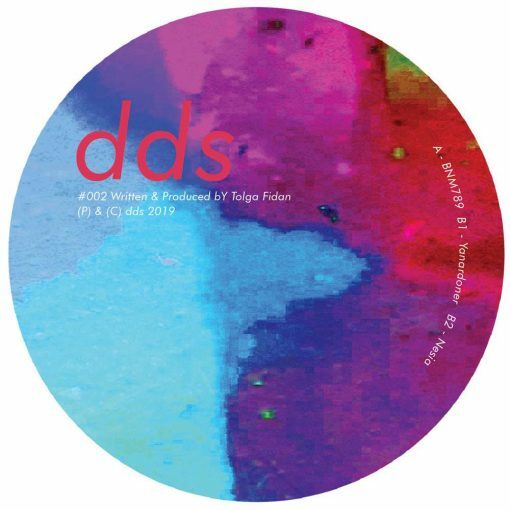 There’s no mistaking that this is a Tolga Fidan production as the bass grooves captivate your mind, body and soul, while mysterious pads and bleeps add depth. The kicks and snares give the track its ‘slap’ – true energy that will get the ravers boppin’. Lastly, ‘Yanardoner’ combines beats that have clout with a lively bassline for extra punch. As the track progresses Tolga introduces a smooth layer of pads to soften the mood and enchant the listener. The graceful top end complements the potent track perfectly, creating a rousing juxtaposition between its hard and soft elements. More items from " DDS "
More items from " Tolga Fidan "